A must-read for those who love reading short, hilarious essays describing the life of a young black woman. This book had me​ rolling on the floor from laughter, nodding my head in approval, and shedding a single thug tear. Being a black woman in America means contending with old prejudices and fresh absurdities every day. Comedian Phoebe Robinson has experienced her fair share over the years: she's been unceremoniously relegated to the role of “the black friend,” as if she is somehow the authority on all things racial; she's been questioned about her love of U2 and Billy Joel (“isn’t that...white people music?”); she's been called “uppity” for having an opinion in the workplace; she's been followed around stores by security guards; and yes, people do ask her whether they can touch her hair all. the. time. Now, she's ready to take these topics to the page—and she’s going to make you laugh as she’s doing it. Using her trademark wit alongside pop-culture references galore, Robinson explores everything from why Lisa Bonet is “Queen. Bae. Jesus,” to breaking down the terrible nature of casting calls, to giving her less-than-traditional advice to the future female president, and demanding that the NFL clean up its act, all told in the same conversational voice that launched her podcast, 2 Dope Queens, to the top spot on iTunes. As personal as it is political, You Can't Touch My Hair examines our cultural climate and skewers our biases with humor and heart, announcing Robinson as a writer on the rise. 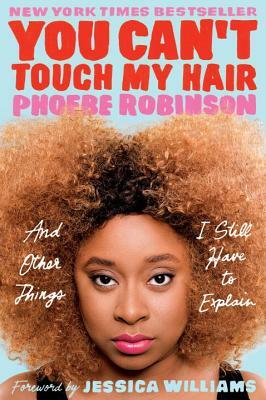 Phoebe Robinson is a stand-up comedian, actress, and the New York Times bestselling author of Everything's Trash, But It's Okay and You Can't Touch My Hair. Most recently, she and Jessica Williams turned their hit WNYC Studios podcast, 2 Dope Queens, into four one-hour HBO specials. Robinson has appeared on The Late Show with Stephen Colbert, Late Night with Seth Meyers, Conan, Broad City, Search Party, The Daily Show, and the Todayshow; she was also a staff writer on the final season of Portlandia. When not working in TV, she's the host of the critically acclaimed WNYC Studios interview podcast Sooo Many White Guys. She recently made her feature film debut in the Netflix comedy Ibiza. “Phoebe Robinson says the things that need to be said, and does so eloquently and hilariously.”—Mara Wilson, author of Where Am I Now? “[a] biting and hilarious debut.”—Refinery29, "The Best Books Of 2016 So Far"